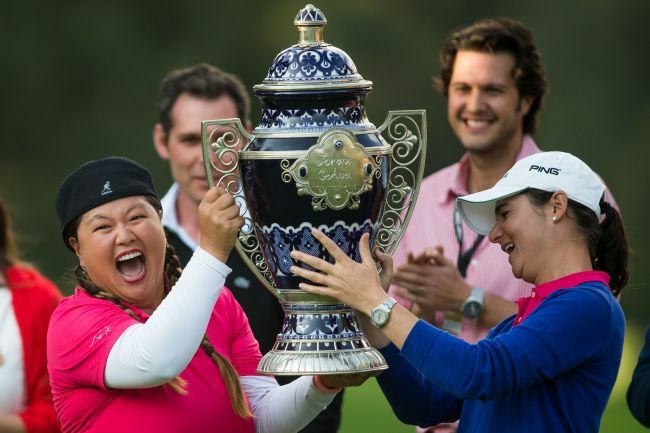 MEXICO CITY (AP) ― Christina Kim won the Lorena Ochoa Invitational on Sunday for her first LPGA Tour title in nine years, beating Shanshan Feng in a playoff after blowing a five-stroke lead. Kim won with a tap-in par on the par-4 18th on the second extra hole. The 30-year-old American celebrated with an exuberant dance and jumped up and down on the green. Kim hugged caddie T.J. Jones, boyfriend Duncan French and friend Michelle Wie, with Wie wiping away tears after embracing the winner. French is Wie’s caddie. Kim won for the first time since the Tournament of Champions in November 2005, ending a 221-tournament victory drought. She also won the 2004 Longs Drug Challenge. Feng, from China, drove left on the second playoff hole, with her ball settling too close to a tree truck for her to do anything but chip sideways into the fairway. With Kim already pin high 20 feet right of the hole, Feng hit her 9-iron approach to 25 feet ― also to the right. Her par putt slid by the right edge, and Kim two-putted for the emotional victory. Feng had a birdie putt to win on No. 18 on the first playoff hole, but left her 15-footer inches short and left. Kim then made a 5-foot par putt to extend the playoff. Kim bogeyed the final hole of regulation ― running a 3-footer past the left edge ― for a 1-under 71 that left her tied with Feng at 15-under 273 at Club de Golf Mexico. Feng shot 66. After bogeying Nos. 14 and 15 to fall into a tie, Kim rebounded with birdies on Nos. 16 and 17 to take a one-stroke lead. Feng played the four par 5s in 5 under, making an eagle on No. 2 and birdies on Nos. 6, 11 and 17, and chipped in for birdie on the par-4 15th. She won the LPGA Malaysia last month. Top-ranked Park In-bee was third at 11 under after a 68. Brittany Lincicome and Ryu So-yeon followed at 9 under. Lincicome had a 69, and Ryu shot 71. Lexi Thompson, the winner last year at Guadalajara Country Club, had a double eagle on No. 2. She finished with a 73, also making two double bogeys, five bogeys and five birdies, to tie for 15th in the 36-player field at 3 under. PLAYA DEL CARMEN, Mexico (AP) ― Charley Hoffman began to wonder if he would ever win another PGA Tour event. Even after he rallied to win the OHL Classic at Mayakoba on Sunday, he was reminded of how long it had been when his wife and two young daughters joined in the celebration. “My last win was when Claire was in my wife’s stomach,” Hoffman said with a smile. That would be his oldest daughter, who just turned 4. Hoffman rallied from a three-shot deficit on the El Camaleon course, taking advantage of Danny Lee’s mistakes on the back nine and Shawn Stefani failing to put any pressure on him at the very end. Hoffman closed with a 5-under 66 after taking two putts for a bogey on the 18th. It was his third career victory. He had gone 105 starts between his first and second win, and this time went 108 starts until winning the final PGA Tour event of the calendar year. He referred to it as a low-stress round, with a few exceptions, including the final hole at Mayakoba. Stefani, who closed with a 69, made an 18-foot birdie putt on the 17th to get within one shot. Stefani then hit into a fairway bunker with a lip so steep that he had no option but to hit sand wedge some 50 yards short of the green. Hoffman hit driver that rolled up against the base of a tree, which forced him to play a left-handed shot back to the fairway. Hoffman safely played some 30 feet left of the hole. Stefani’s pitch came up woefully short, and he chipped to 5 feet. That allowed Hoffman two putts for the win, and he rolled his par putt to within 18 inches for a tap-in bogey. Hoffman finished at 17-under 267. Lee ran off seven straight birdies on the front nine to take the lead, but the former U.S. Amateur champion couldn’t hold on. Lee didn’t make another birdie the rest of the way, dropping three shots on the back nine for a 67. He finished two shots behind in a tie for third with Andres Gonzalez, who had a 67 for his best career finish.